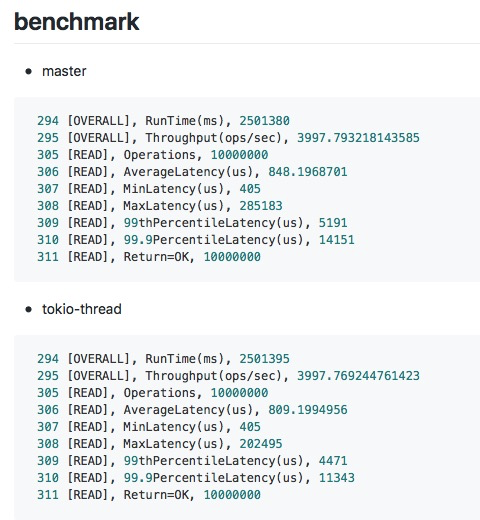 Before uses futures-cpupool to implement ReadPool, but tokio-threadpool is faster and more stable under high race condition or workload, so replace it to improve the performance for storage read and coprocessor request. Meanwhile, use thread local variable to replace context struct for metrics. Improvement (change which is an improvement to an existing feature). Unit tests, integration tests, and partial manual tests. From the pic above, under high wordload and stable qps, the p99 latency of read reduced about 14%, and the p999 latency reduced about 20%. to make it more clear that spawn returns a Result<()>. Before the recv order was certainly Ok(2)Ok(3)Ok(7)Ok(4), but now it's order changes every runs. So I am not sure whether it is a problem. Then let's not check the recv order any more. Let's only check whether or not full is returned, since futurepool already has complete tests. This is a work-stealing pool and the scheduling order is not as predictable as the previous one. I think using thread_local everywhere is long and redundant. If we want to represent thread_local, mostly, we can use tls instead. Yeah, tls looks to be a good name! /// Tried to trigger a tick in current thread. It is a very cool feature. after this, I even think we can remove another threadpool, we can use future::lazy to wrap the task and so we can unify the thread pool. Thanks a lot! Mostly fine. How about the metrics? Have you checked that they are working as intended? We can now mark state as initialized when tracker is built, so that this line doesn't need any more. Is the name really important? I guess most of time default name should be enough because the rest of the usage are in tests. you may try to replace it using Builder::build_for_test as well. It may work. For this one maybe we can use Builder::from_config(..).build() (because we don't need on_tick or before_stop in this test). Similar for others. Let's remove it since it is not used. let's rename it to make it more clear. maybe.. thread_local_collect_executor_metrics? let's rename it because no more "future_execute". I'm fine with both, maybe not much difference. ok, I will do a benchmark about this. Good job! I'm fine with this PR, as long as the metrics are working as intended. Personally I prefer storage::ReadPool. Impl looks like a private thing. ReadPool had been used, maybe use ReadPoolProducer. Is it ok? Or ReadPoolContext? It just can build a ReadPool and handle some metrics. It's not a ReadPool indeed. It just "derive"s the common ReadPool to create a specialized ReadPool that attached some name, some lifetime hook functions (like on_tick). That's why it was called ReadPoolImpl. Producer or Builder might not be a very good name because it will be confusing for functions like Producer:: tls_collect_executor_metrics. Agree with Producer and Builder are not good enough. How about remove the struct? There are too many RefCells. How about put the struct in a RefCell or Mutex? I think it's more clear. Nice catch. You should arrange them as.. In this way, we only need to check borrow once when updating multiple fields. Rest LGTM. Thank you very much! ping @siddontang @breeswish @hicqu , please take a look.